Ahh, it’s so much fun to be a kid in Hanukkah. You get a lengthy vacation from school. Your parents actually encourage you to eat doughnuts and chocolate coins. And there’s plenty of shows to drag mommy and daddy to. This year 3 different “singing competitions” compete for the kids’ attention. The traditional “Festigal”, a newer “Festival” that aims to restore past glory, and another show by the cables’ “Hop” channel. The time: Today, at 8pm sharp. The place: Rabin Square, the heart of Tel Aviv. The mission: Mass pillow fight. While the hurricane season is running rampage at the Atlantic Ocean, a different sort of hurricane is set to hit the Tel Aviv coastline this Friday. A dedicated group of people (dedicated to having fun, that is) is planning to host a public game of Twister on Bug’ra’shov beach tomorrow evening. 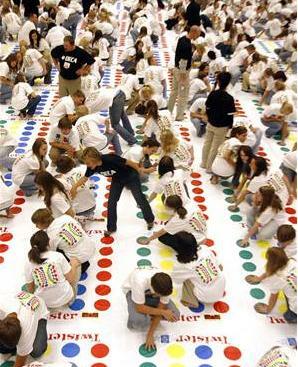 They promise to bring a huge Twister board, and over 1,500 people have been invited. Stop by if you dare. Yamit Pool is located in the pastoral kibbutz of Netzer Sireni, and the place offers great opportunities for kids and expecting mothers to enjoy the soothing effect of lying in the water, or the fun of splashing around with Yamit and her dedicated and professional staff. Yamit also treats children who have special needs with hydrotherapy techniques, and her website boasts a number of enthusiastic testimonials. The name Yamit implies “of the sea” in Hebrew, and she has taken her birthright to a whole new level.